Clonandra Cottages are in the heart of the famous fish-filled Irish Lakelands, set in 25-acre grounds over looking Lough Garrow. This is a 4-star development with a mixture of six cottages from a studio that is perfect for two anglers, or you may choose cottages with two, four and even five bedrooms. You have sole use of each cottage so there is something for every angling party. The cottages are warm and inviting with open turf fires and oil-fired central heating. They are fully furnished to 4 star standard. Many have en-suite bedrooms and all are equipped with washing machine/microwave/fridge/cooker/TV. Towels are available on request, all bed linen is provided. Available on site is an 8-person hot tub and sauna. Cavan is famous for its fine angling and these days you can expect fast, furious sport, catching hard fighting hybrids up to 4lb, along with the usual bream, roach, skimmers and pike on the Erne system. 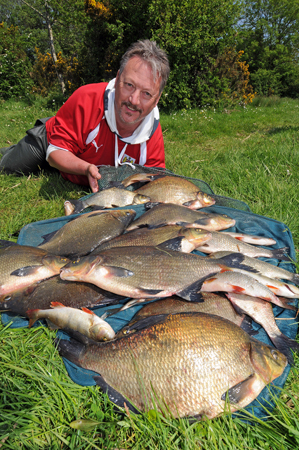 In recent years there has been a mini-explosion of tench in the county’s 365 lakes and at Clonandra there are even carp to be caught – just in case you are feeling homesick! There is private fishing on Lough Garrow within a short walk of your chosen cottage. There is an 18ft Sheelin boat with outboard motor available for hire at a cost of €50.00 per day for residents including delivery to the chosen water and fuel charge included. You can order your bait in advance so it will be here on arrival, please get in touch and we will be more than happy to ensure your order is awaiting you.